In lieu of flowers memorial donations may be made to the El Dorado Springs City Cemetery. 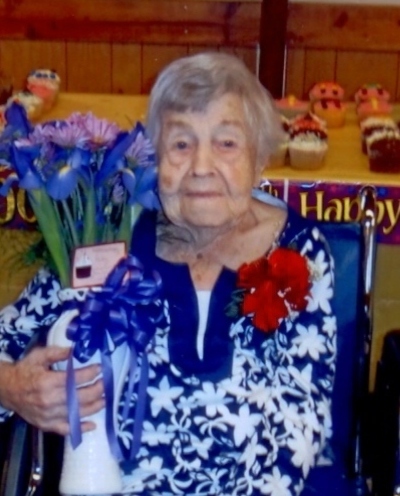 Ruby Merle (Koger) Skakal, age 100, of El Dorado Springs, Missouri, passed away at her home on Monday, July 2, 2012. She was born in Cedar County, Missouri, to Amos Elmer and Maggie Ann (Sibley) Koger. She was the youngest of five children. Her older sister, Hazel, named her when she was born. She attended Union Hall Country School and El Dorado Springs High School. She had always wanted to be a teacher which she fulfilled for fifteen years after attending Springfield Teachers College. Ruby taught school seven years before marriage and eight years after marriage. She would walk to school five miles each way for eight months with no spring breaks, no snow days, and definitely no school buses for the students. She carried her own lunch and continued teaching until her country schools closed. On April 17, 1932, Ruby married her sweetheart of many years, John Skakal. They were married for thirty-four years before John passed away suddenly in September, 1966. To this union two children were born: Kenneth John and Judy Kay, both of El Dorado Springs. Ruby was actively involved with 4-H while her children were growing up. She received an “Outstanding Leader Award” for her great job. She said all the kids she worked with won many ribbons at the Ozark Fair and the State Fair and she was very proud of their accomplishments. Ruby and John were always kept very busy with milking cows and farming because there was no such thing as a day off. In 1986, Ruby moved to town. She enjoyed visiting, especially with her neighbor Dorothy. She loved to garden and quilt. All the kids, grandkids, and great-grandkids received her quilts before she was unable to quilt any longer. Ruby helped raise two of her granddaughters after their mother passed away. After they grew up and had their own families, she babysat some of them until they started school. Preceding her in death were her husband, John; her parents; her four siblings: Clarence, Hazel, Guy, and Golda; a daughter-in-law, Janice Sallee Skakal; an infant niece; and a nephew. Survivors include her children: Kenneth and wife Kathy and Judy Mann and husband Lynn; grandchildren: Jan Rowland and husband Tom; Jill Thomas and fiancé Jeff Janes; Russell Mann and wife Kelli; Dusty Mann Waite and husband David; and Kody Skakal and friend Ginelle Esry; ten great-grandchildren and four great-great-grandchildren; one niece; two nephews; and a host of other relatives and numerous friends. Funeral services for Ruby Skakal were held Saturday, July 7, 2012, at 10:00 a.m. at Bland-Hackleman Chapel with Rev. Brent Bland officiating. Tom Rowland and Chris Edwards provided the music. Interment followed in the El Dorado Springs City Cemetery under the direction of Bland-Hackleman Funeral Home. Pallbearers were Russ Mann, Rusty Mann, Dalton Howell, Chris Edwards, Tom Rowland, Kody Skakal, and David Dines.